Frost and crisp air have greeted me the past few mornings when starting my commute to UBC, two signs in these early days of December that the holidays are approaching. Around the city, empty lots are being turned into temporary sites for Christmas tree sales, lights are being strung up, and wreaths are being hung upon doors. In the spirit of the holidays, I’ve chosen to write an entry on Viscum album, or European mistletoe! The images of this species are courtesy of stevieiriswattii! @Flickr, who uploaded them to the Botany Photo of the Day Flickr Pool (image 1 | image 2). Viscum album, a member of the sandalwood family, is a hemi-parasitic evergreen shrub. Hemi-parasites are plants that receive additional nutrients via a haustorial attachment to a host, but are also able to photosynthesize. In the case of mistletoe, their parasitism can lower the host tree’s vigour, induce premature mortality, reduce the quality of wood, or induce water stress. As a species, Viscum album is able to infect a large number of host plants. There are five or six subspecies of Viscum album recognized, differing in part by host specificity. For example, Viscum album subsp. 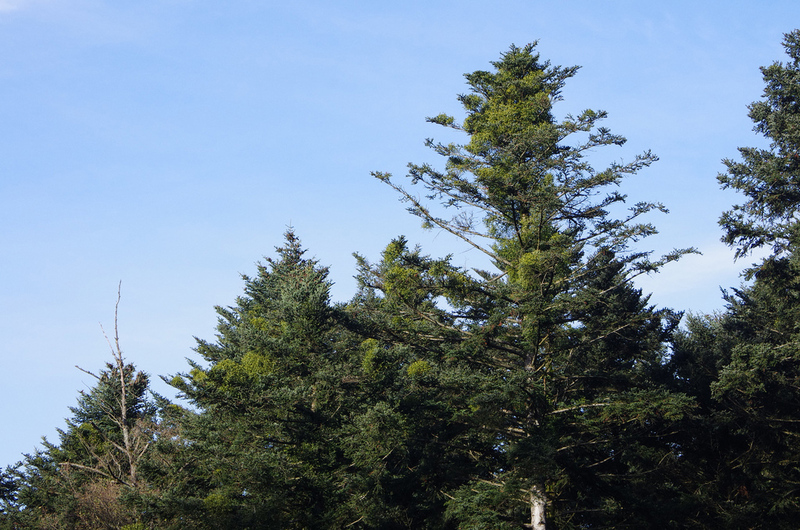 abietis (shown today) is a parasite on Abies (fir) species (in today’s case, silver fir or Abies alba). Similarly, Viscum album subsp. austriacum parasitizes Pinus (pine) species and rarely Larix (larch) or Picea (spruce) species. Other subspecies parasitize flowering trees or different conifers. European mistletoe is dioecious and insect-pollinated. The flowers are yellowish to green and inconspicuous. The fleshy white berries ripen through the early winter in Europe, and are bird-dispersed from late winter to spring. Birds do eat the berries, but digestion is not necessary for seed germination. Instead of eating the berries, birds will sometimes disperse the fruit by dropping the berry in flight or while on the tree. The mucilaginous viscin on the outside of the berry allows it to stick to the bark of the tree, where it will eventually germinate and infect (see Kahle-Zuber, D. 2008. 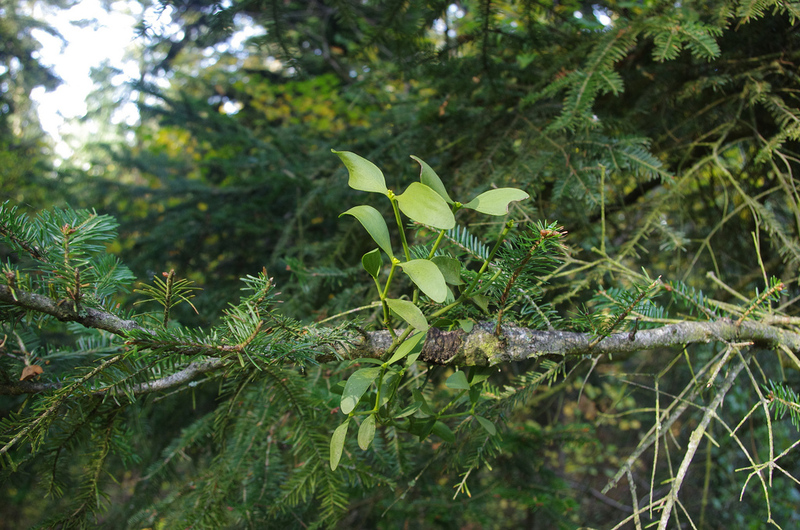 Biology and evolution of the European mistletoe (Viscum album). (PDF) Doctoral dissertation, ETH Zurich, No. 18080. Mistletoe appears extensively in mythology and folklore. To the ancient druids of Britain, mistletoe was a symbol of magical powers and medicinal properties. From Norse legend, Balder (a Norse god and the son of goddess, Frigga), was killed by mistletoe. However, his life was later restored and Frigga, in her joy, said that anyone who passed under mistletoe should receive a kiss. This custom remains today, with kisses being shared under the mistletoe which is commonly used as a Christmas decoration. Where this truly originates, I’m uncertain, although it is known to have been part of Christmas customs since at least the seventeenth century. If you live in Vancouver, and are looking to decorate for the holidays, the Friends of the Garden are selling hand-made wreaths at the Shop in the Garden until December 23, 2013, or until quantities last! Thanks for sharing this glimpse of life in Vancouver. Poetic and educational it was a true pleasure to read. I worked on the pollination of dwarf mistletoe in the 70’s. Several papers back then indicated that Viscum album is wind pollinated. Also it currently belongs to the family Viscaceae. I’ll ask Taisha to pull whatever references she found re: pollination, but as to family designation, we use the latest version of the Angiosperm Phylogeny Group. Viscaceae has been sunk into Santalaceae (and is now the subfamily Visceae). There are botanical humour reasons for the Christmas-associated mistletoe to be in the Santalaceae as well. A study of Australian mistletoes was published last year in the Proceedings of the Royal Society – http://tinyurl.com/mwf6qzt – with the conclusion that Loranthaceae mistletoes in Australia are keystone species. Experimental removal of them from woodland plots resulted in mean losses of 20.9% in species richness. I wonder if the Santalaceae mistletoes share this impressive attribute. Viscum album was accidentally brought to Sonoma County in California by Luther Burbank and can be found on poplars and various fruit trees. Thanks for this holiday centered entry. It brings back a good memory of my parents getting fresh mistletoe and hanging it at Christmas. The stories of this plant were so interesting. Thanks for the inspiration. Here in Norfolk, England, the main Mistletoe host is Lime but many other species are infected. There is an old boundary Hawthorn (Crataegus monogyna), said to date back to the 14th century, heavily infected with Mistletoe for many years. The tree, known locally as the Witch of Hethel, does seem able to cope with the burden. Incidentally, but not really relevant, young, single girls are said to go & touch the Witch on Mayday, but as to why they do this I have no idea.